Just when you’ve concluded the Proms are little more than schmoozing, emollience, accessibility and tradition, along comes Valery Gergiev and the Munich Philharmonic Orchestra with Galina Ustvolskaya‘s Symphony No. 3. Regarded superficially—and, tragically, this is the way the majority of commentators regard her work—Ustvolskaya’s music is the antithesis of comfort. She eschews most of the conventions of western art music, typically bringing together unusual groupings of instruments (often timbrally and registrally incongruous) which articulate themselves from within the strictures of an utmost rigid rhythmic grid. Again regarded superficially, she is the ostensible apogee of the cool, aloof, unemotional, detached composer. Which leaves the question of why four of her five symphonies, as well as the three ‘Compositions’ (together covering a period from 1970 to 1990, the last 20 years of her composing life), should be subtitled with overt religious quotations, extended to recited texts in the symphonies. Is it irony? mischief? sacrilege? What if, instead, she was simply being honest? We’re all painfully aware these days of how religion is very much more (or, depending on your view, less) than a collection of dogmas the belief of which tick-box you into a joyous life of buoyancy and bliss. On the contrary, religion—both within the larger subcultures of the faithful and also, particularly, within the mind of the individual believer—is riven with and arguably defined by guilt, conflict, misunderstanding, doubt, intolerance and fear. With this in mind, Ustvolskaya’s music speaks with a terrifying clarity and immediacy that, furthermore, makes one seriously question why there isn’t more religious music displaying a similar kind of aesthetic. Heads in the clouds? or in the sand? Composed in 1983, and first performed nearly 30 years ago on 1 October 1987 in Leningrad, her Symphony No. 3 is scored for a male reciter and a small orchestra comprising five each of oboes, trumpets and double basses, three trombones, tuba, piano and percussion (2 bass drums and a tenor drum). Registral extremes and dry percussion seem apt considering the work’s subtitle, ‘Jesus Messiah, save us!” For the words, Ustvolskaya drew on the same source also used in symphonies 2 and 4, a portion of text by Hermann Contractus (also known as Herman the Cripple) that she found in a Russian anthology of Mediæval Latin literature. The stanza used here is essentially a cry for help, contextualised by deeply longed-for attributes of the deity—almighty, true, eternal, peace—and culminating in the de profundis exhortation, “save us!” It’s like a Kyrie squared (or, considering one of Ustvolskaya’s favoured percussion instruments, a wooden box, cubed), an abject expression of despair flecked with the thinnest thread of hope. Despite appearances, immediacy is Ustvolskaya’s aim, regardless of the fact that the text was recited in actor Alexei Petrenko’s native Russian (it would have been especially nice to have heard it in English). But the message is stark and clear. The words are first proclaimed alone, whereupon Ustvolskaya moves through a sequence of repeating clusters, pained lyricism over low judderings, and oblique, circular chord sequences. Crotchets everywhere. Like a post-apocalyptic chorale, it climaxes in a second recitation, this time desperately repeating the final phrase: “спаси нас”, “save us!” Ustvolskaya then gradually retreats from her threadbare, quantised lyricism into an insular world of dead drum tremolandi, like a solipsistic fanfare for the end of the world. When the rest of the instruments return, now joined by the piano, their music seems to continue only through the most grim and relentless inner determination (again, the thin thread of hope), its apparent circularity becoming actual, stuck in a dazed, glazed repeated rut for a time. Silence. And then suddenly we’re back at the beginning again, only this time Ustvolskaya seemingly ups the tempo leading to a third recitation, the final phrase now becoming a sporadic thorn in the side of the symphony’s increasingly subdued, growling, tremulous withdrawal back into the shadows, tinged with the most infinitesimal whiff of expectation. Symphony No. 3, like all Ustvolskaya’s music, is a staggeringly powerful demonstration of raw expressionism. Her music doesn’t so much speak as sear, roil and lacerate—fearful and bruised but nonetheless bold; full of despair yet clinging to that one remaining iota of hope—striking to the heart of both her subject matter and her audience. She is not easy to listen to, and she’s even less easy to hear—but then how is that different from any other authentic prophetic voice? For sheer, bludgeoning catharsis, Ustvolskaya is hard to beat, and yet…I’ve never managed to shake the feeling that, as with Vermeulen and Ruggles before her, the tiny-oeuvre-plus-trenchant-views-plus-reclusiveness combination has allowed a mythology to develop that the notes-on-the-page themselves don’t quite warrant. Certainly her contemporaries Schnittke and Gubaidulina explored/have explored similar themes with greater variety and, arguably, greater wit. First of all, i don’t personally find Ustvolskaya’s music cathartic; rather, i find it makes me reflect long and hard (about matters both musical and not) but there’s no real relief in that experience. And i mean that as a strong compliment to her work. Second, her ‘mythology’ doesn’t interest me in the slightest; the same commentators who rely solely on the superficial aspects of her work also rely on this schtick of her being a grumpy old reclusive woman before trotting out for the umpteenth time that old chestnut about her and Shostakovich. FFS, faced with ignorant commentators like that, who wouldn’t end up grumpy and reclusive?! 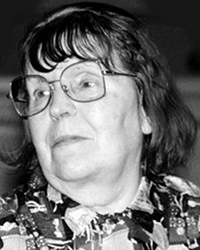 And as for Schittke and Gubaidulina, you’re right, they do compose with greater wit, but i don’t believe for one moment that wit is something Ustvolskaya sought to utilise in her work at all. Besides, in Schnittke’s case isn’t it more usually sarcasm? All fair comments. Everybody listens in different ways, I guess, and in my case I’m unable to listen without asking whether the music really measures up to the lofty claims (be they coming from a place of ignorance or not) made of it. As I said, I have similar problems with Vermeulen and Ruggles, and in all three cases I’m prepared to own that the problem may be mine. Re:Schnittke, his “polystylism” is much deeper in its intent, I feel, than the sarcastic parody/pastiche of his mentor; rather, it’s about a search for musical self-knowledge through “dialogue” with one’s compositional forebears. This is explored much more thoroughly in this fascinating Ph.D. thesis. Apologies; this is what I was attempting to link to. Thank you for this celebration of Ustvolskaya; I couldn’t agree more about the superficiality with which she’s – frustratingly – too often approached. I too was at the (exceptional) performance last night – it was a particular pleasure to hear members of Munich Phil, whom I’ve heard previously engaging imaginatively across every age but for the contemporary. It was frustrating (certainly in my area of seating) to hear the irritation with which the piece was approached by the audience. Regarding her religiosity, it reminds me in many ways of that found in cinematic works by Tarkovsky (and, in a different context, Bela Tarr), where God is to be approached through the materialist, through the muddy, dirty and unpleasantness without order that is – the works argue – the gateway to our holy as well as temporal existence. I am in Australia and have just heard the 4th of the 2016 Proms broadcast here on the ABC on 25th July. I was fascinated by the program. After the “inharmonic intensity” of this Bolero performance, and the dare I say overt romanticism of Rachmaninov, here comes this little symphony (though why the word ‘symphony’ applies to this work I’m not sure) which really made me sit up and take notice. So much so that I immediately applied a Google search on the work – which is how I came across your insights (for which I am thankful). It is indeed ‘the most beautiful ugly sound in the world’ – of this BBC Prom. I know nothing of the composer, so cannot comment about her religious or otherwise intent in this work, and (yes, and English translations would have been gratefully accepted!) it did speak to me of its subject matter. There IS an element “defined by guilt, conflict, misunderstanding, doubt, intolerance and fear” in religion, certainly in my Christianity understanding, but to say that it is riven with that attitude seems a gross overstatement. But without those associations, we cannot cry out “Save Us!” and mean it, without an understanding of what it is from which we are being saved. The ‘symphony’ was that expression to me, and I am thankful that I wasn’t in the live audience, because I too would have been frustrated by the ‘irritation’ from a Proms audience that Adam L mentioned. That aside, it was a bold piece of programming to include such a work at the Proms. I for one, thank the programmers for so doing – I want to hear more! I too have come along the work of Galina Ustvolskaya (Preludes & Compositions; Trio, Sonata & Octet; Piano Sonatas from 1998) and immediately had to stop and listen carefully. Great to see/hear BBC Proms are showcasing her work! Thank you for writing this article. I’m always curious about other listeners perceptions specially when it’s overlapping authentic prophecies.